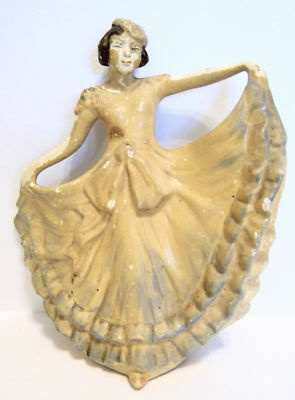 This is an extremely rare figurine from Crown Devon produced in the 1930s by the Fielding factory in Stoke-on-Trent. As with some of the Wade figurines of the same period, it is one of the series which were coated in cellulose until it was found that this eventually turned the model yellow and caused the paint to begin to flake. Hence figurines in perfect condition are virtually impossible to pick up. If one is found, the chances are that it has been restored. This lady is called 'Juliet' and is one of only a few not designed and created by Kathleen Parsons, hence its further rarity. This one has an impressed number 145 and a design number in black on the base of F.156. She stands 5.5 inches (14 cms) tall. As with the majority of these models, the paint is flaking but there are no chips/nibbles nor restoration work at all. I am more than happy to provide further photos if required. Please use the 'Contact Us' tab at the top of the page to request such photos.